Debut sensation Christian O'Connell is back with more hilarious adventures of Spike, super-star radio DJ... and trouble-prone ordinary kid. Meet Princess Scallywag - a feisty new heroine with more than a few tricks up her royal sleeve! From brand-new picture book pairing Mark Sperring and Claire Powell comes this hilarious, subversive fairy tale for girls and boys alike. Archer B. Helmsley longs for adventure. But how can he have an adventure when he can't even leave his house? A beautifully illustrated, magical re-telling of one of the most beloved fairy tales. Continuing the Deep Space Nine saga-an original novel from New York Times bestselling author David R. George III! 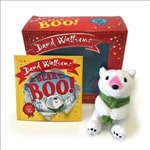 A bear-illiantly funny adventure from Number One bestselling picture book duo, David Walliams and Tony Ross, this special gift set includes a cuddly toy to play with.